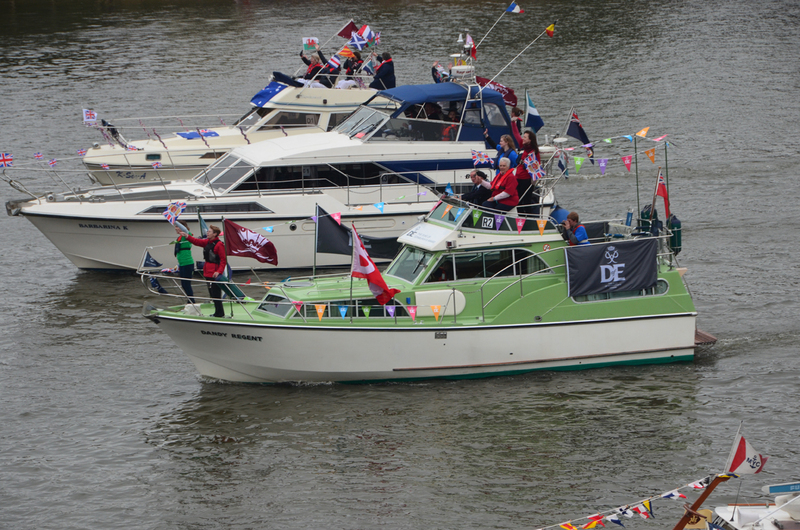 Having Thames Motor Yacht Club boats participating in the Queen’s Diamond Jubilee Pageant was an incredible honour for the club, particularly members, skippers, crews, families and friends there on the day. 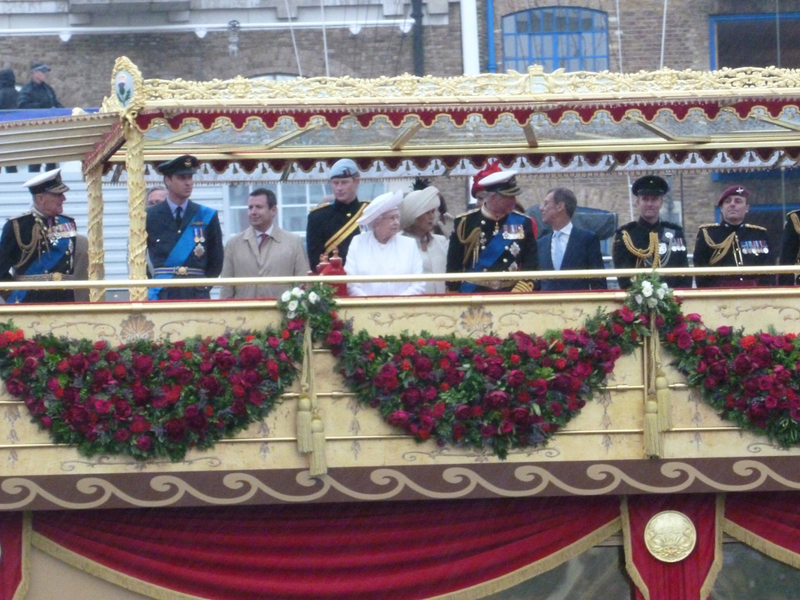 Branded ‘a once in a lifetime experience’, it was a remarkable event to be treasured. 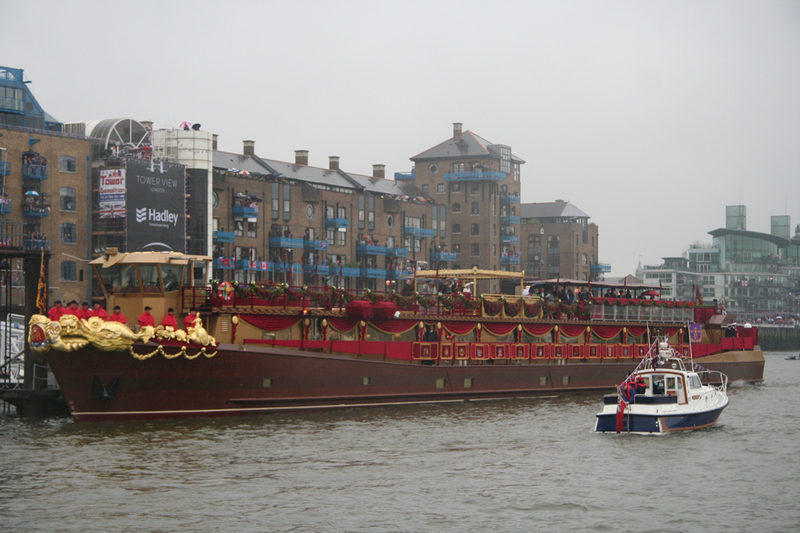 Before this flotilla could take place, a tremendous amount of hard work was put in by everyone involved. 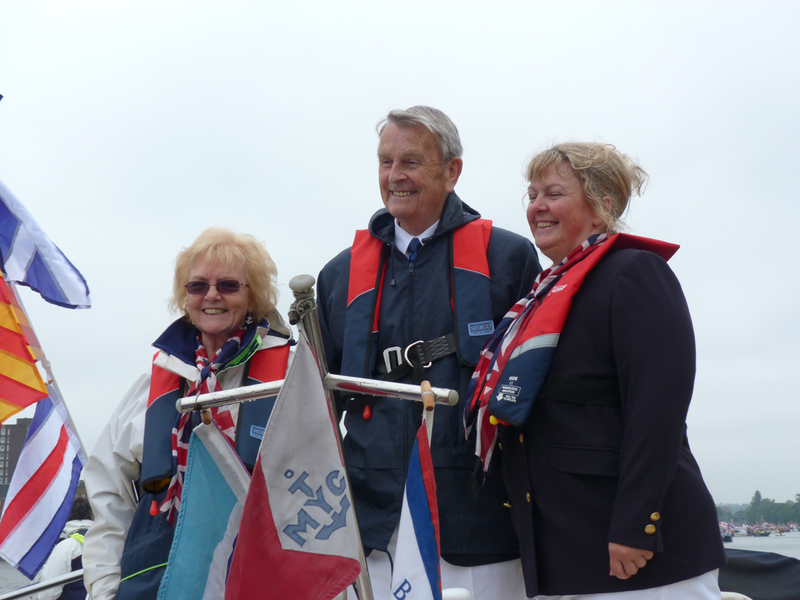 The TMYC story began when club President Michael Shefras MBE was asked as Chairman of the Association of Thames Yacht Clubs (ATYC) to be the section leader of the pageant’s Recreational Motorboat Squadron (RMS). 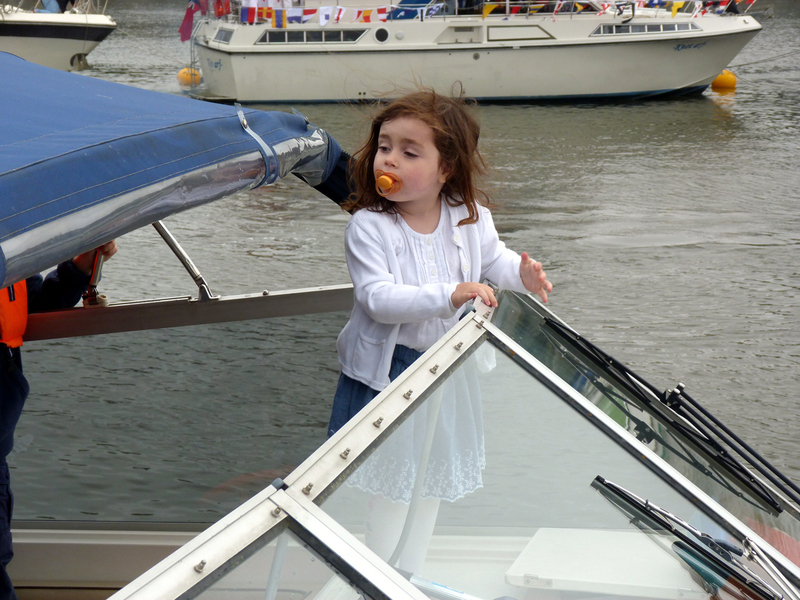 Endless hours of ‘behind the scenes’ planning and meetings for Michael with the Port of London Authorities (PLA) and Pageant organisers began more than a year prior until motorboat rehearsals were ready to begin. 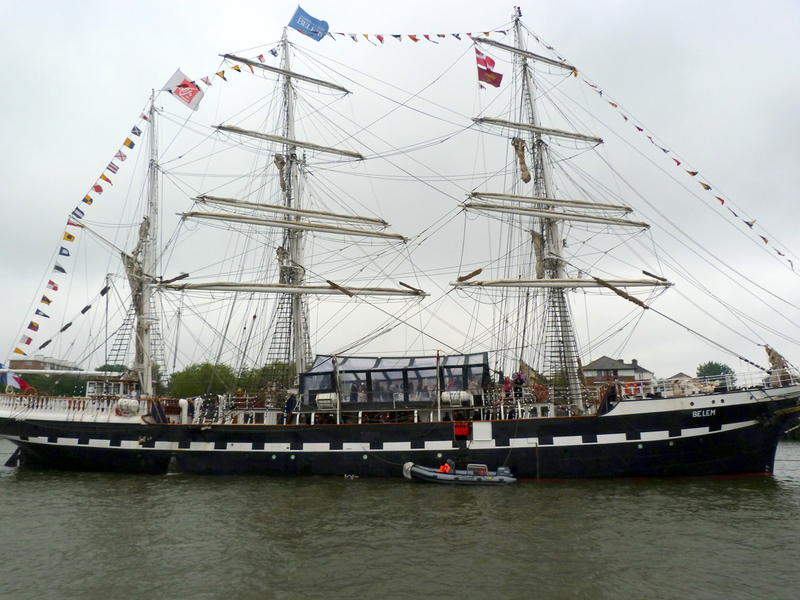 As rehearsals required boats, all ATYC clubs were notified and volunteers leapt forward but it was made clear from the start, rehearsals would not guarantee pageant places. 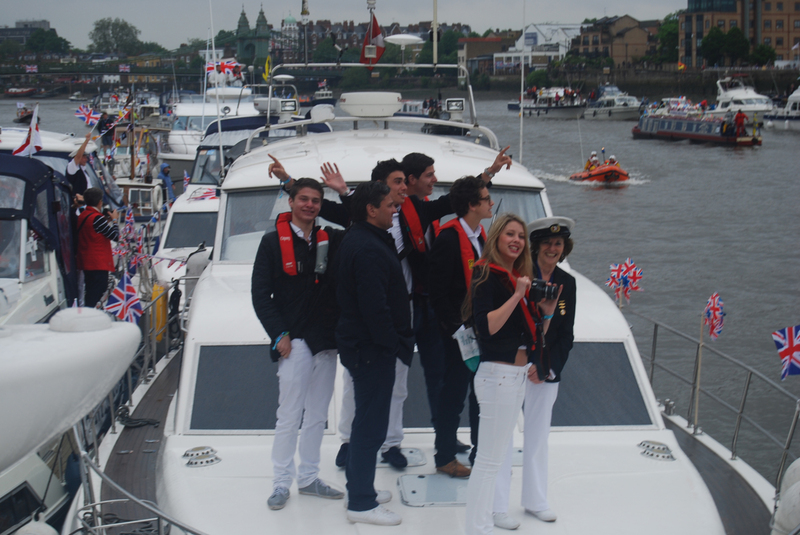 A number of TMYC boats took part, the first being on June 26th 2011. 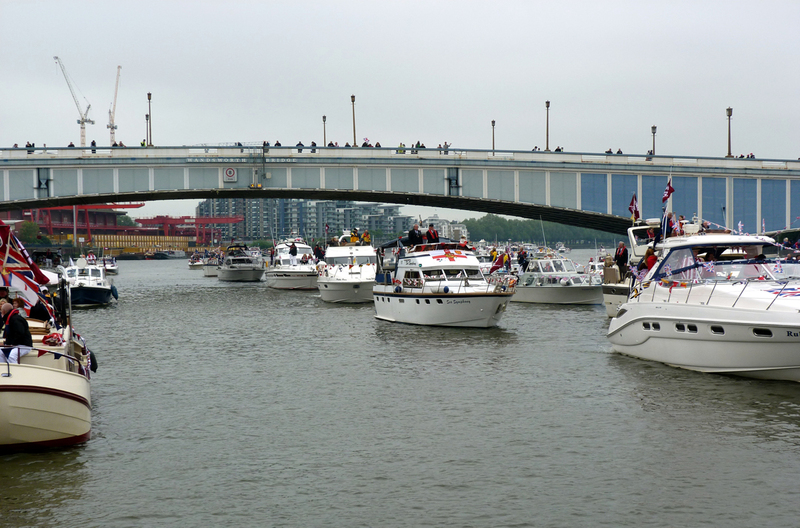 Initially treated as boat handling experience, the flotilla maintained a three abreast formation with the tide, navigating bridges whilst mindful of pleasure boats out in force. 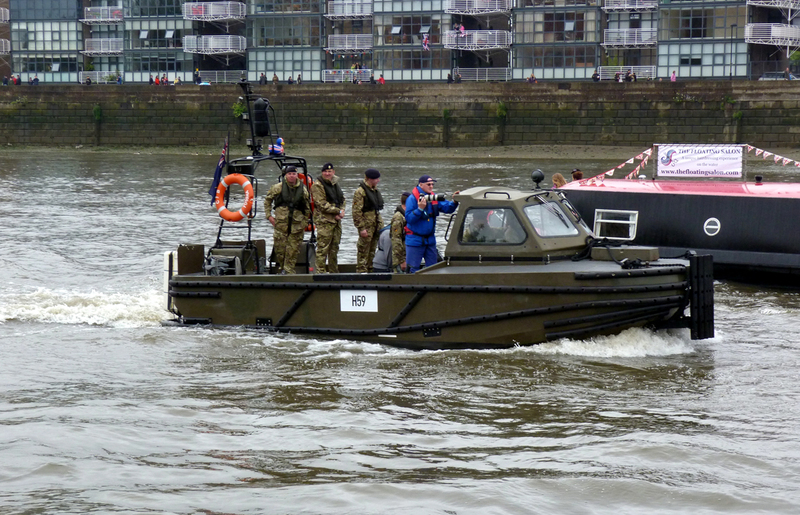 Clubs were then contacted for volunteers for a second rehearsal on September 10th, this time giving motorboats the opportunity to take part in the Mayors Thames Festival River Parade. 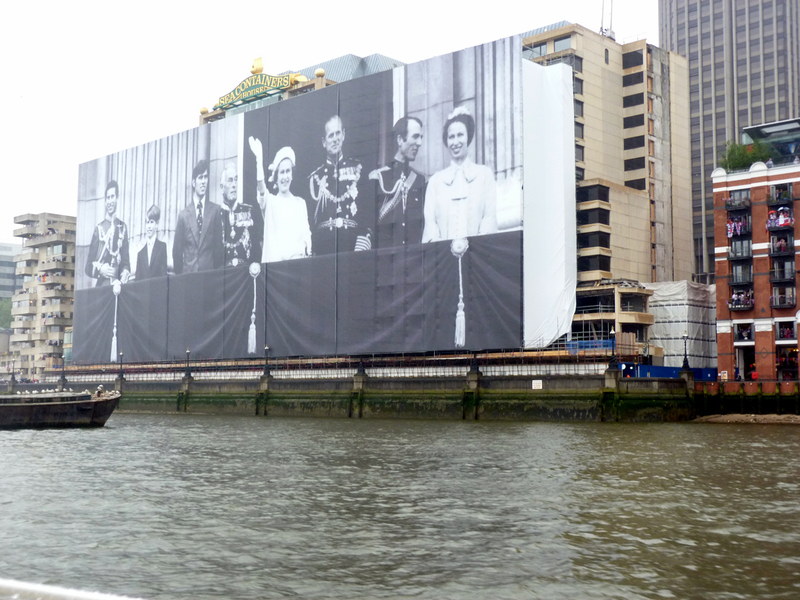 A fun day with spectators lining London’s riverbanks and bridges to cheer boats on, Boris Johnson’s event gave a taste of what was to come, although everyone realised chances of final selection for the Queens Pageant were remotely slim, to the point of wishful thinking. 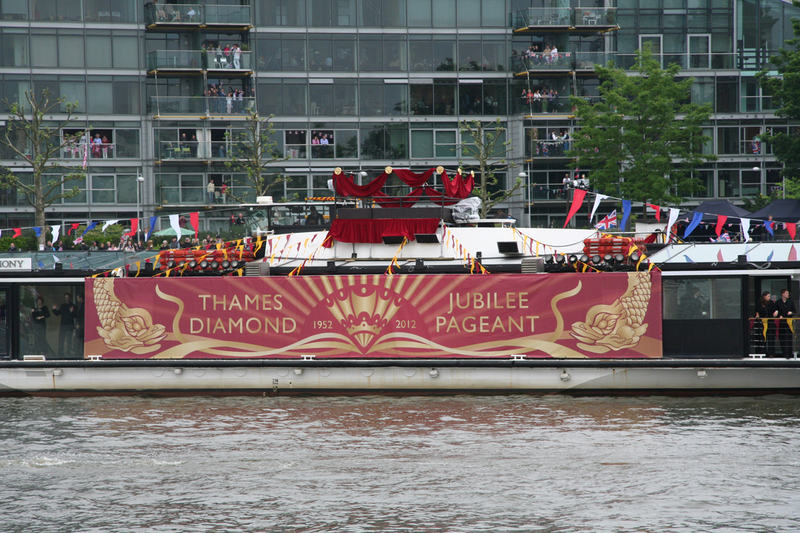 By the end of December 2011 invitations from the pageant organisers were emailed to successful applicants, creating excitement amongst those lucky to be chosen. 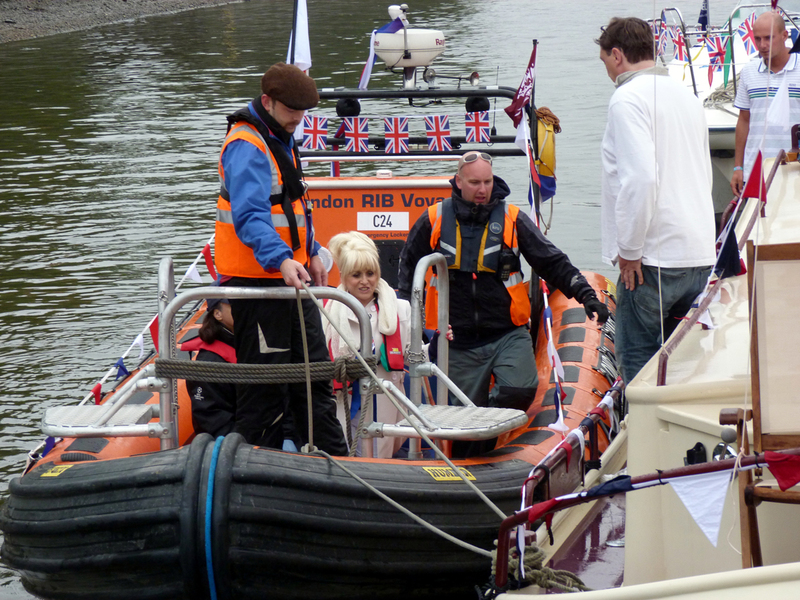 Amongst the RMS line up were a variety of naval and land based dignitaries, and TV personalities including Barbara Windsor, Steve McFadden and Alan Titchmarsh. 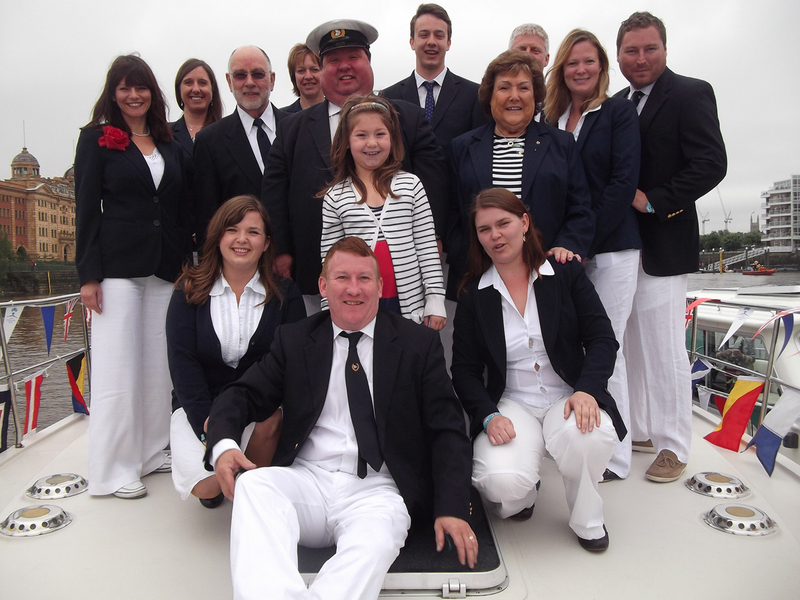 From this day on skippers were deluged with information on every possible aspect, mooring, locking and passage plans, pageant positions, procedures, briefings, timings, diagrams, spreadsheets, booklets, charts, contacts, boat maintenance, regulations, expectations, health and safety, security, dress code, protocol, weekly newsletters and updates – you name it, there was enough to fill a filing cabinet! 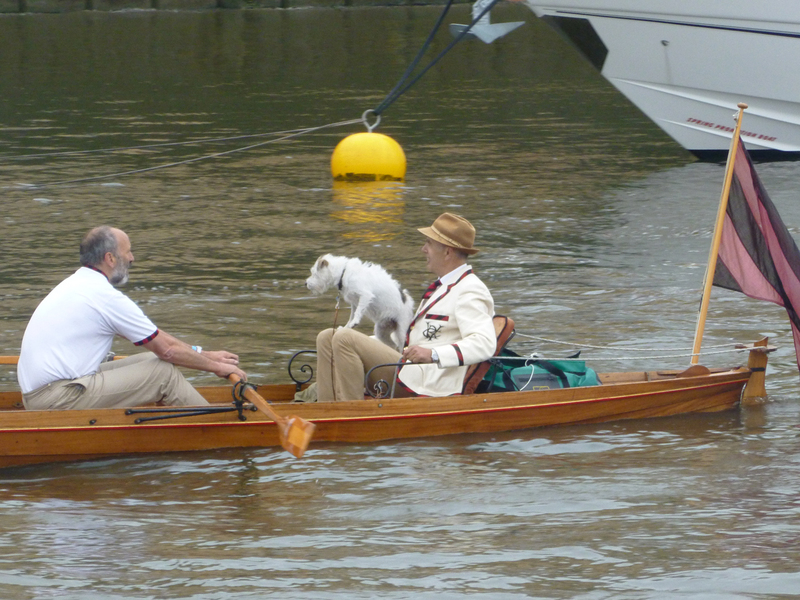 Not all TMYC boats attending the rehearsals were selected. 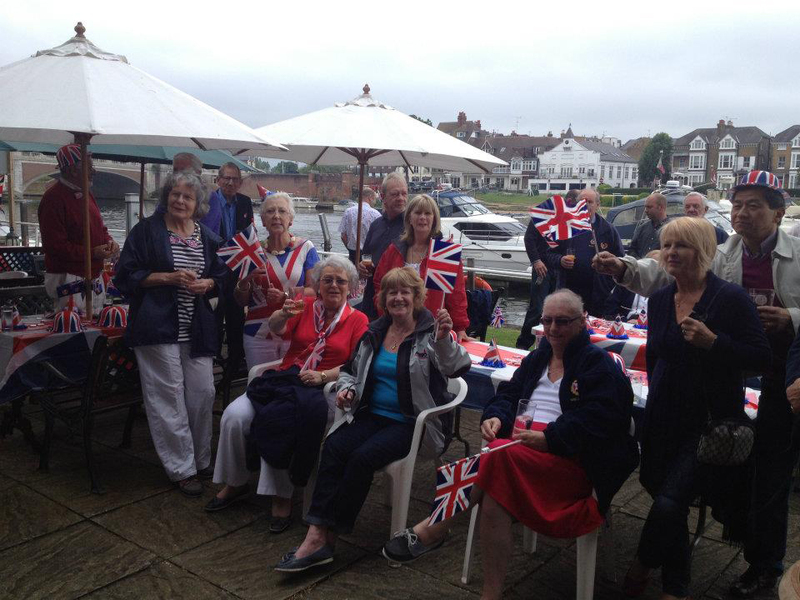 Dismay aside an addition was made to the club programme; a members Jubilee Party with a barbecue and a large TV screen to be set out on the lawns to watch the days events unfold, with the added comfort of the clubs’ Riverside Bar for whatever the weather would bring. Unsurprisingly this club event was another rapid ‘sell out’. 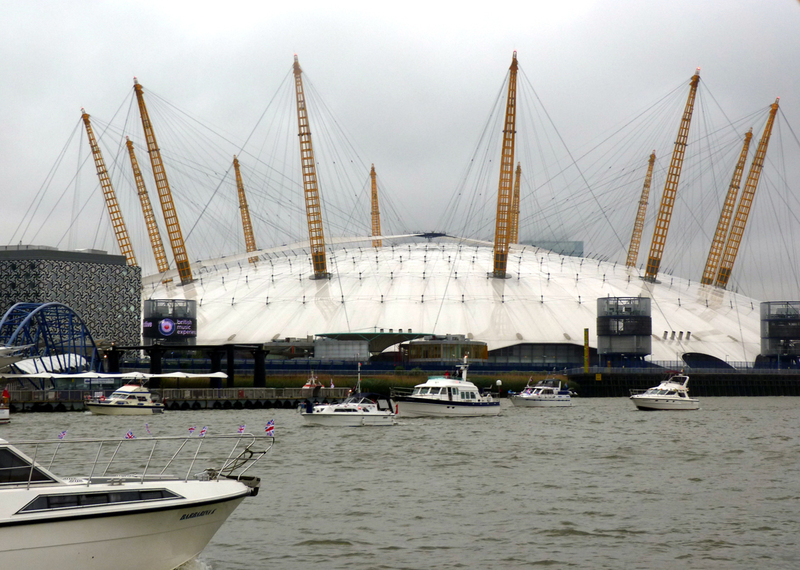 Another rehearsal took place from Chelsea’s Imperial Wharf in April 2012. Skippers navigated the route in a four abreast formation and practiced an emergency stop and turn around. Learning curves were realised and new procedures formatted for the day. 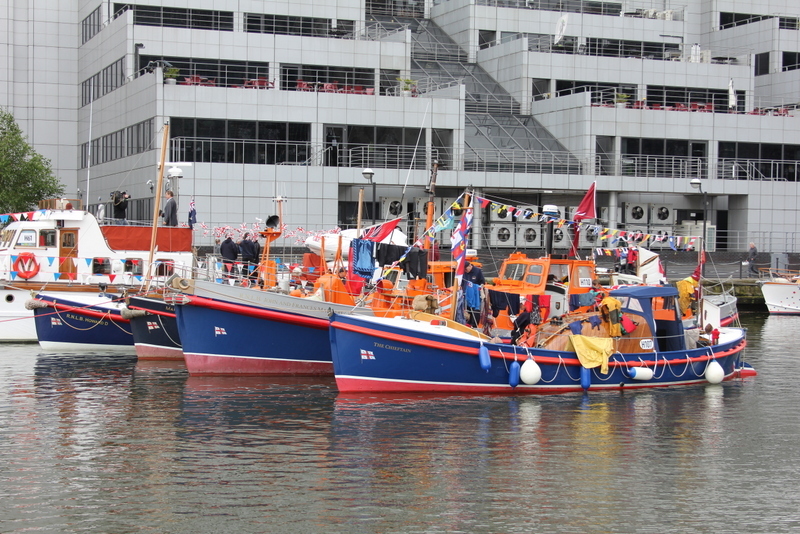 Until then skippers had time for final boat preparations to meet the approval of two checks to be carried out by the Marine Coastguard Agency before the pageant. The ATYC kindly arranged a demonstration at The Windsor Yacht Club to run through plans to moor a vast number of boats to anchor buoys. 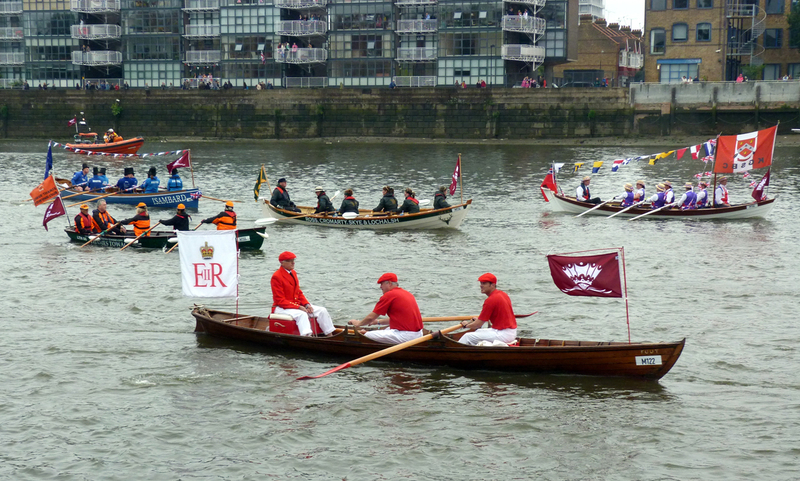 The PLA strategically placed buoys in the Barn Elms Reach downstream of Hammersmith Bridge, with separate areas for squadrons to muster for the start of the pageant. 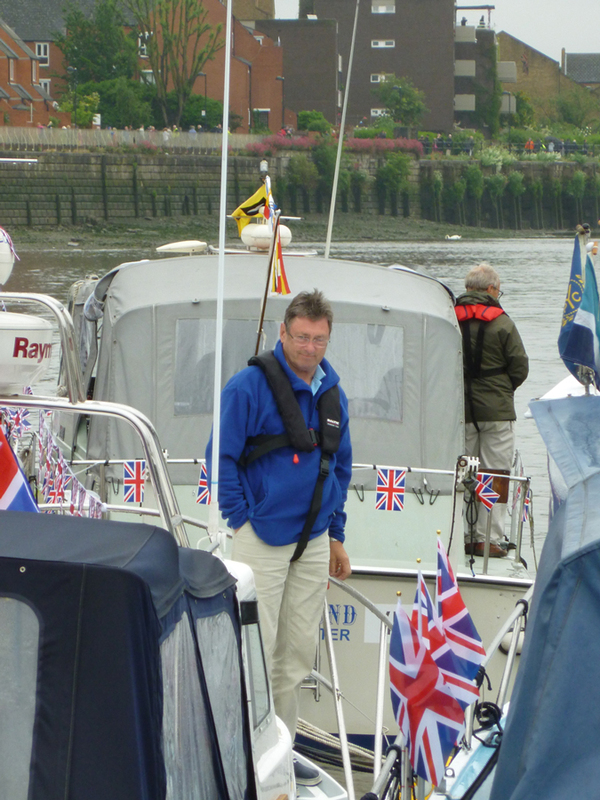 ATYC Vice Chairman David Jones did a sterling job demonstrating to skippers by using his own boat how to share the buoys without getting snagged. Ironically he was one of many not selected to take part. 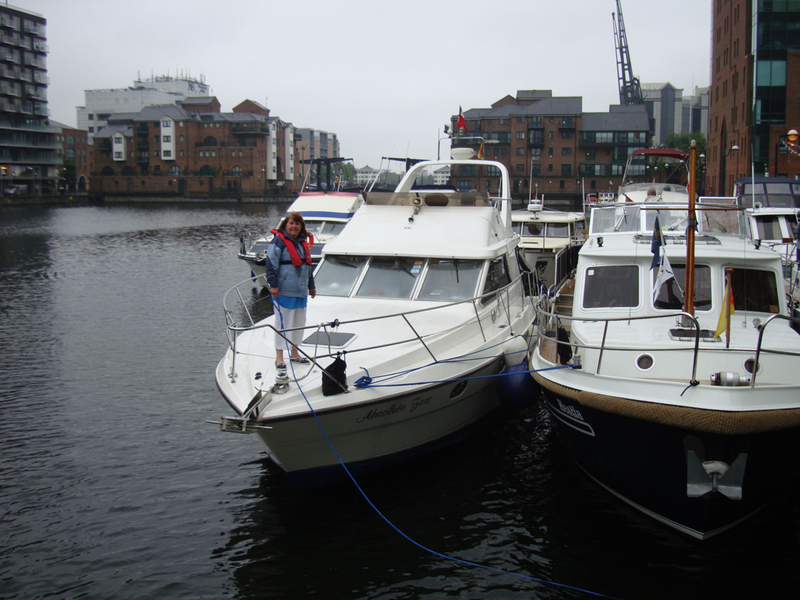 Items on the check list were to be expected, ensuring each boat was in good working order, with all safety aspects intact and in date, including the anchor, towing line, lifejackets, fire extinguishers, bilge pump, first aid kit, skipper and boat accreditations, and a few trick questions thrown in for good measure. 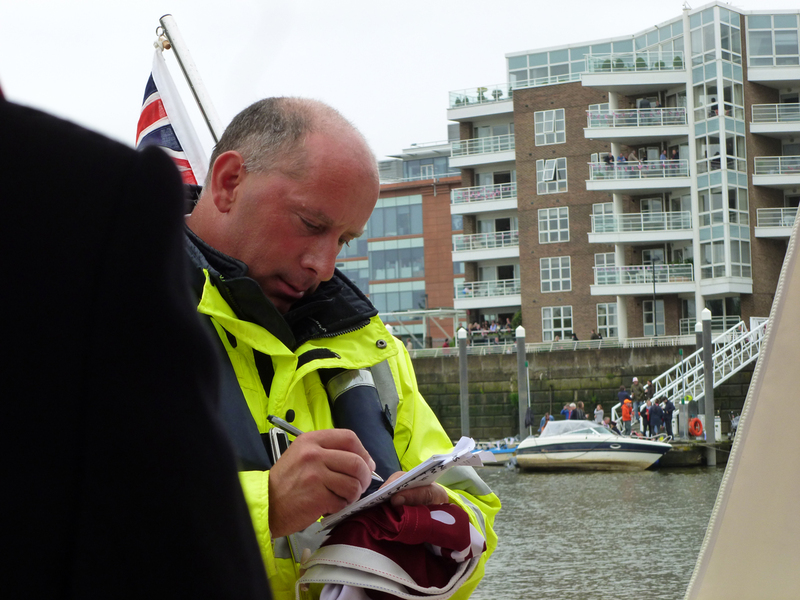 Each person boarding a boat had undergone police security checks having completed numerous forms. Keeping up with everything became a full time job, with near panic setting in as the pageant fast approached, mainly down to the fear of forgetting to do something. Notes to self and check lists were rife! 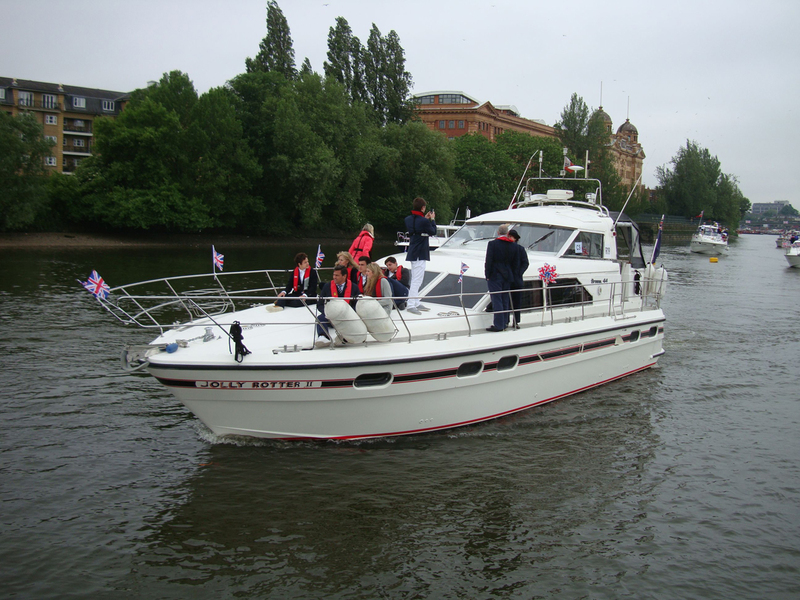 A gentle morning departure on Friday June 1st for TMYC boats headed for the Docklands to meet with the TMYC President and Commodore for preliminary pageant procedures. 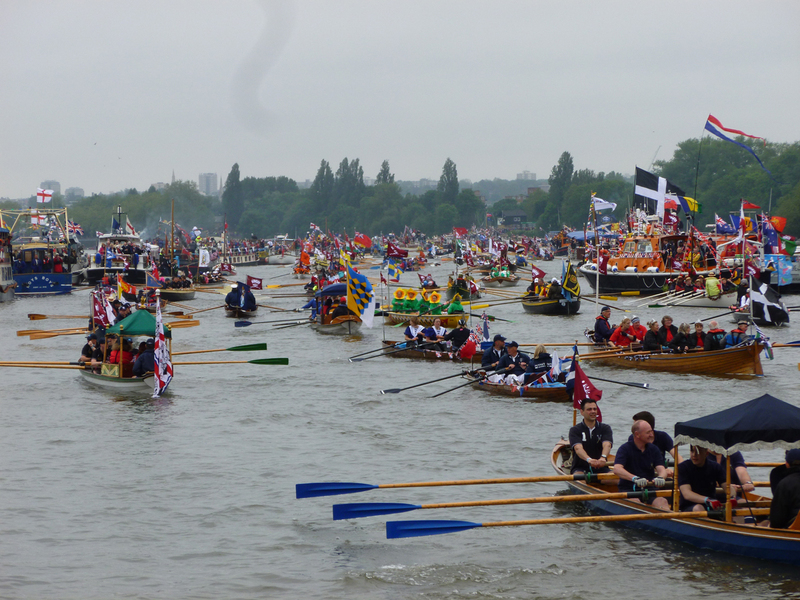 The river was busy with boats, Union Flags and bunting visible everywhere, the excitement and anticipation notched up to higher levels. 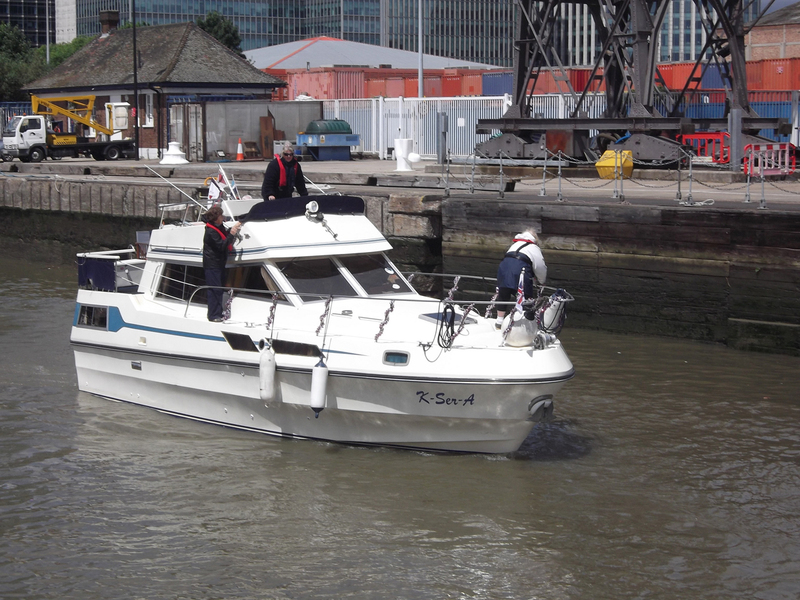 Arriving at West India Dock for the 3pm lock, boats joined other squadrons waiting in turn for scrutineers to board each boat for the first inspection. 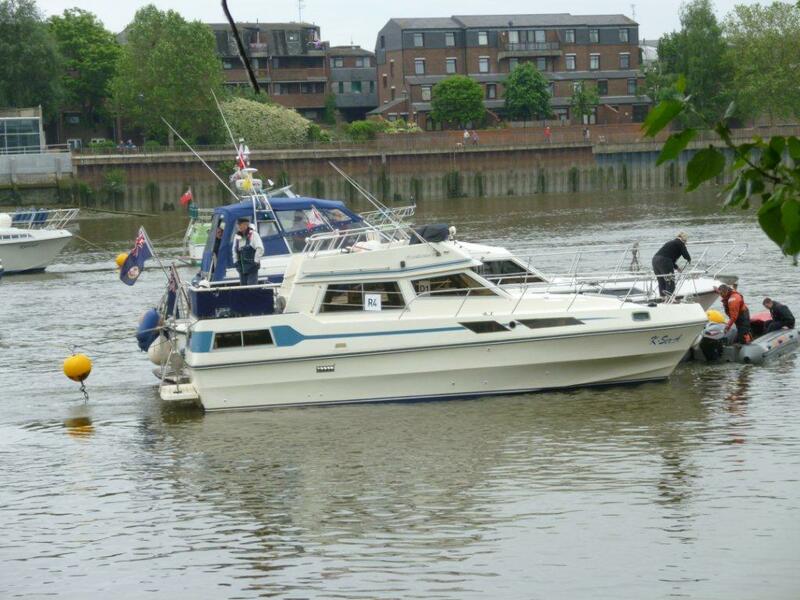 A nerve wracking time, knowing if a boat didn’t pass, it wouldn’t participate. Fortunately TMYC sailed through with just enough time to rush to the pageant cabin, join the next queue for compulsory security wrist bands and boat display numbers, then sprint over to the Hilton Hotel for the 7pm briefing by Pageant and PLA officials; a marathon day in itself! With thanks to the Hilton for providing copious amounts of complimentary drinks for everyone to unwind after the briefing. 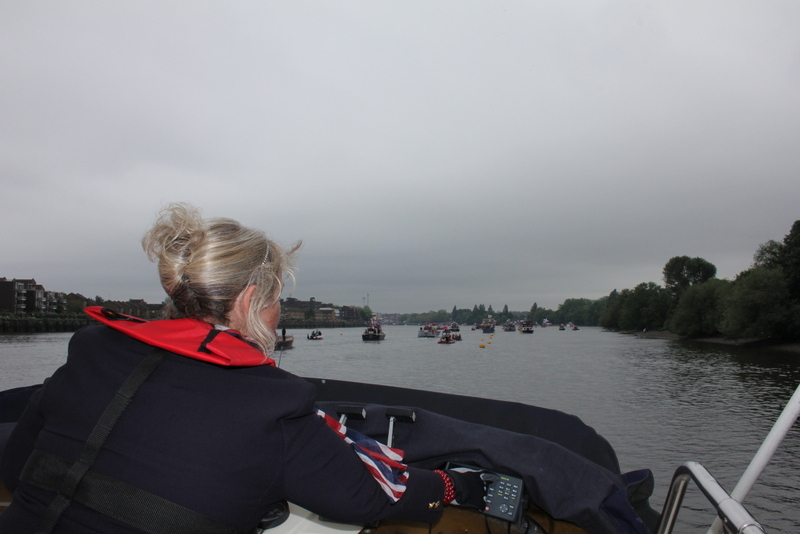 Up from 6am on Saturday 2nd, motorboats were back in the lock for 7am heading for Barn Elms Reach to designated buoys. 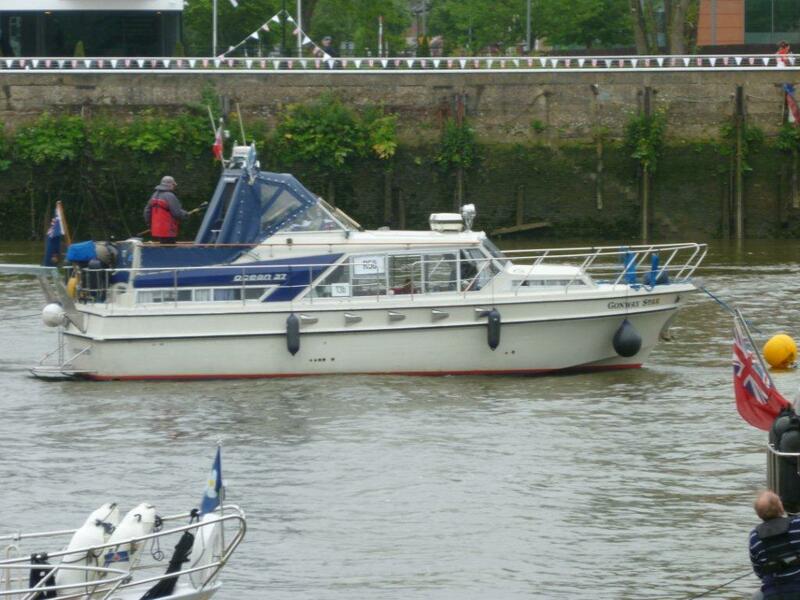 Another good day of weather so once moored midstream for the night, it was time to get the boats ready. 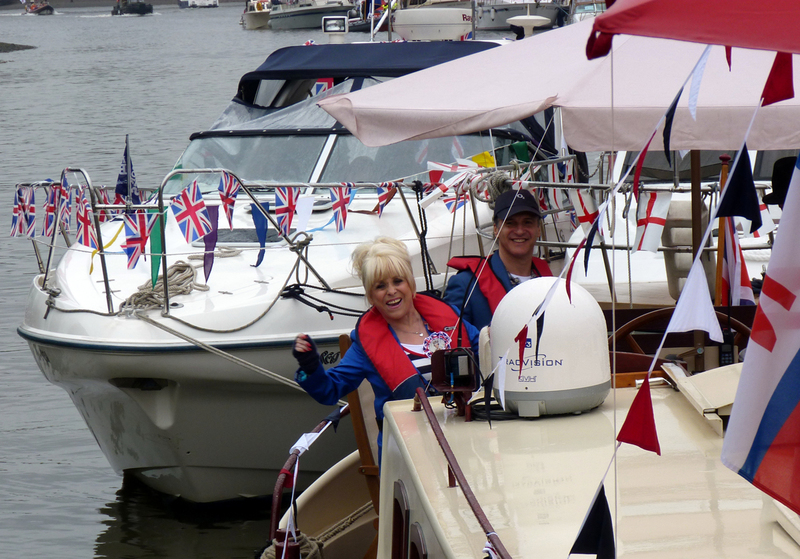 Last minute boat maintenance checks, then the flags and bunting came out. 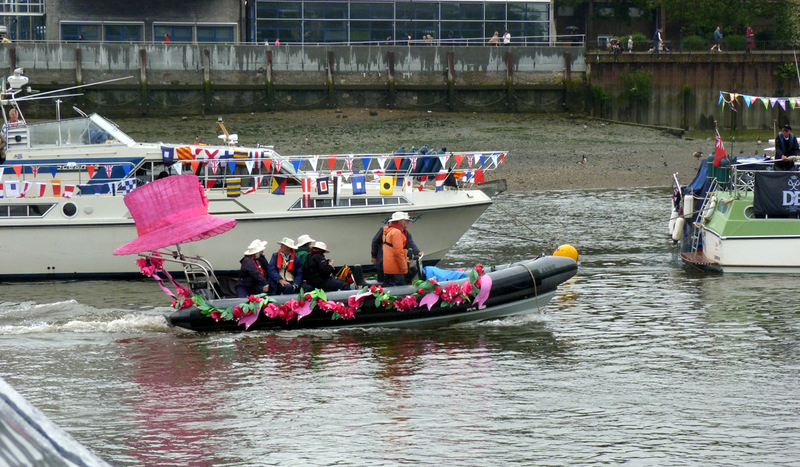 Boats were awash with colour and pride and everyone shared a great sense of humour and camaraderie. 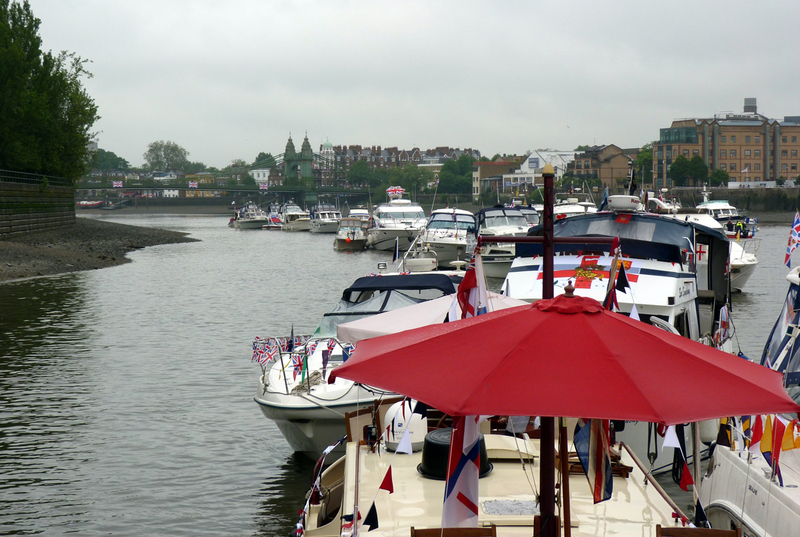 A tranquil time yet anticipation filled the air with excitement, water taxis took people to and from shore and helicopters circled as more boats made for their positions, the atmosphere buzzed in true British style. Sunday 3rd finally arrived and as forecasted – it was raining! Water taxis brought families and friends to the boats from Dove Pier. Hot drinks, wet weather gear and umbrellas were the order of the day. 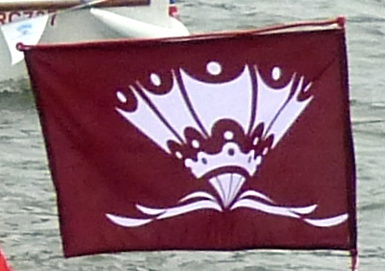 Final boat inspections took place and official Pageant flags were issued to identify each boat as part of the Queens flotilla. 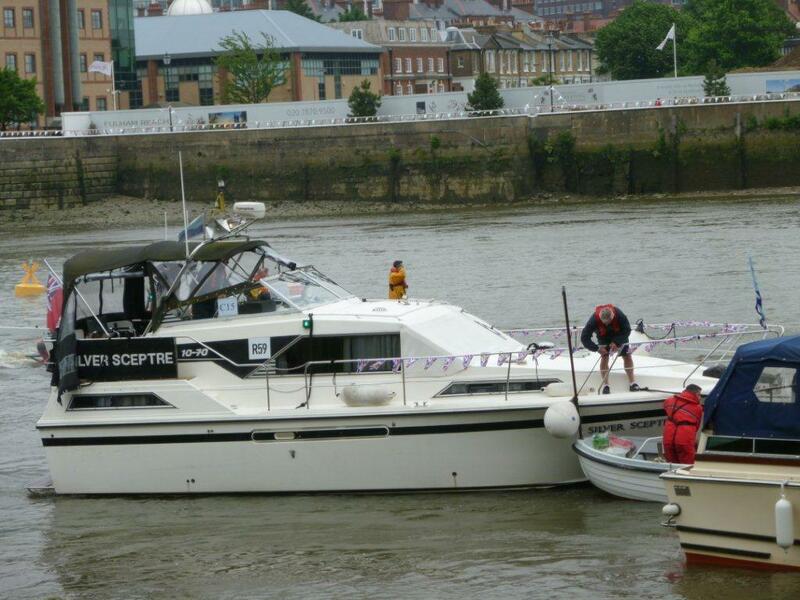 Skippers held briefings with crews and guests, everyone knew what to do. 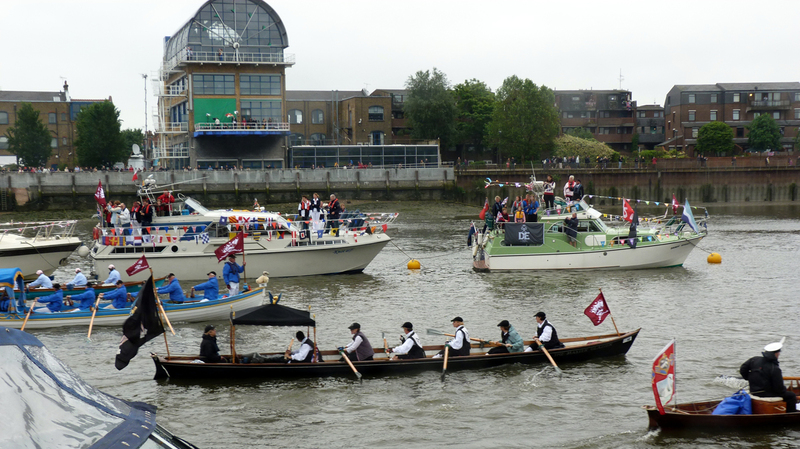 The Dunkirk Little Ships came by on their way from Teddington to take up their positions ahead, followed by rowing boats, skiffs, dragon boats, shallops, RNLI lifeboats, work boats, fireboats and the Gloriana; the motorboat squadron had just been treated to a pageant of their own, waving and cheering on crews passing by to take up their flotilla positions. Suddenly it was time for the countdown! 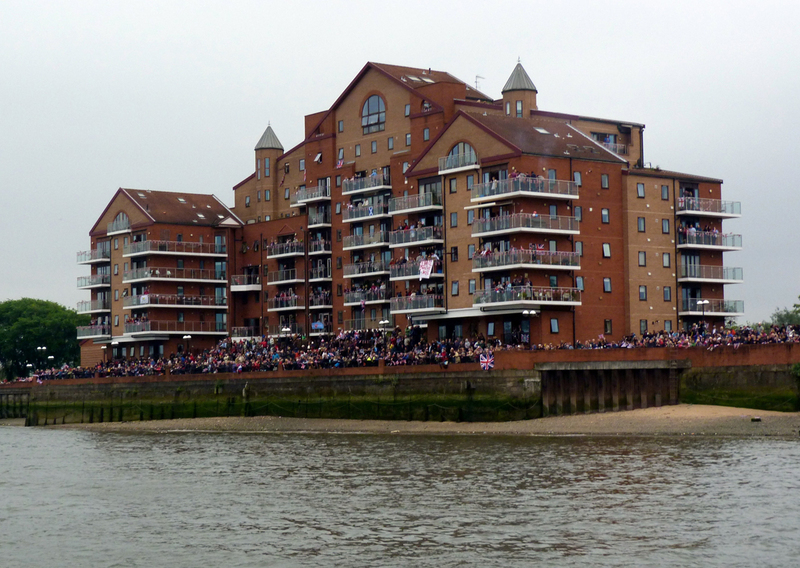 Once underway the excitement excelled, crowds were out in droves to welcome boats passing by. 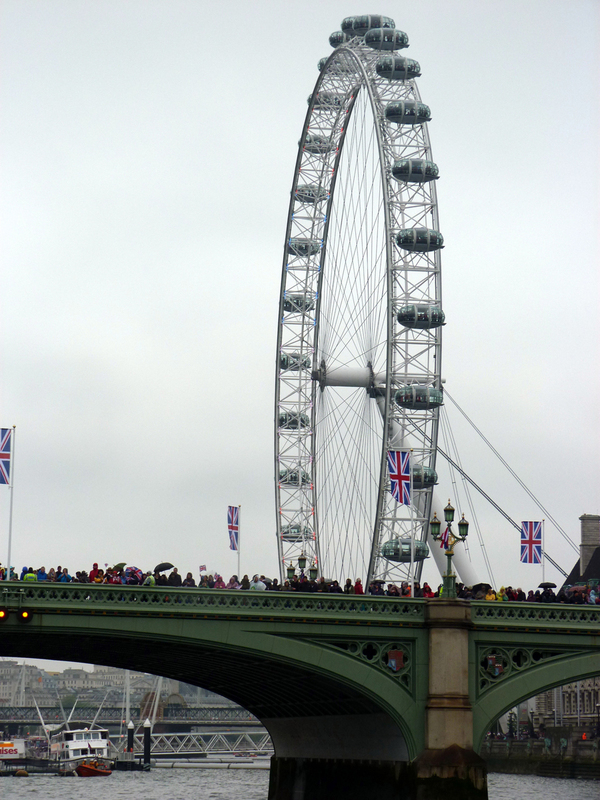 There were cheers, waves, flags and bunting everywhere, from bridges, river banks, buildings, balconies windows and roof tops. No words could do the atmosphere justice, it was breathtaking. 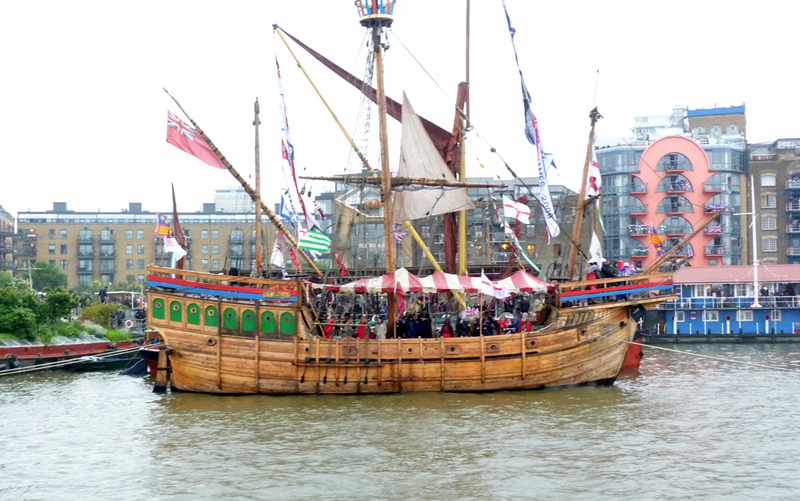 In particular the respect deserved by the crowds for stoically remaining to cheer the boats, as by now the rain had started. 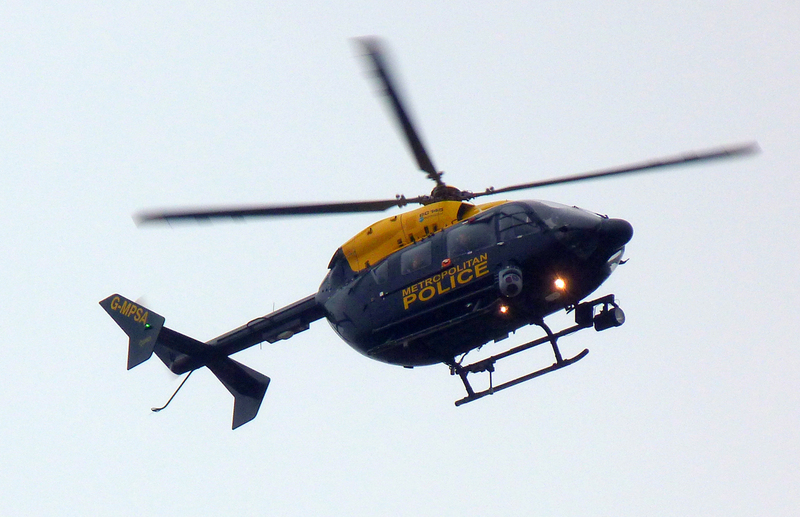 From what appeared to be a light shower quickly turned into a heavy downpour which continued relentlessly. Determination overtook any attempts by the rain to spoil the day, despite being drenched everyone carried on regardless, the cheers and flag waving kept everyone going. It was an incredible day, lots of wet, but happy smiling faces. 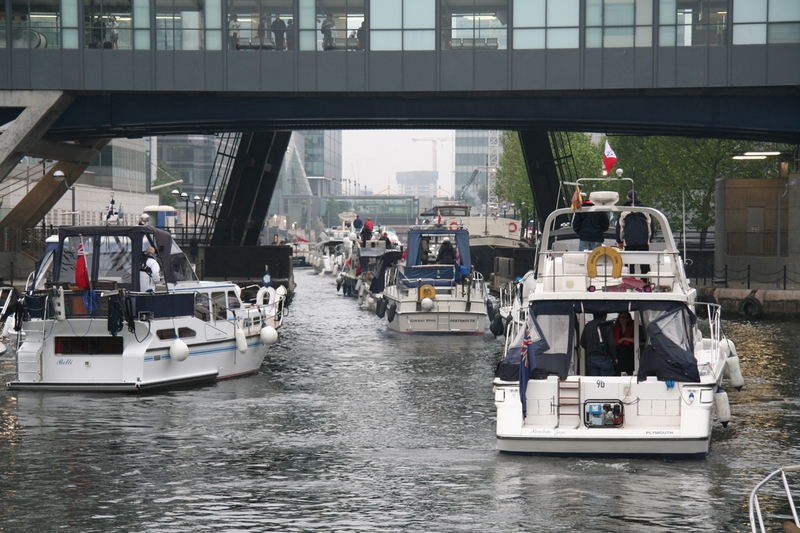 Bridge by bridge, skippers held their boat positions and cleared the arches as planned. Everything ran like clockwork. Navigators monitored progress and photographers on and off boats clicked away to record the event. Throughout the journey ships horns could be heard including the hearty blasts coming from the steam boat Alaska and the work boat Kent. 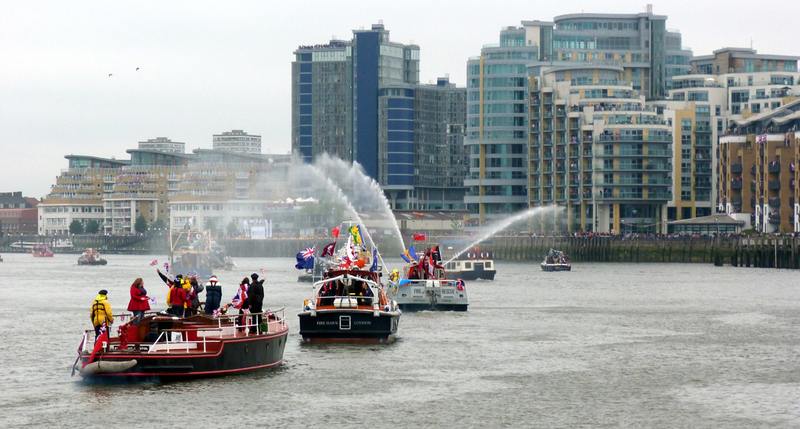 Fireboats added to the spectacle by proudly jetting out large plumes of water. Time passes quickly when you’re having fun and this day was no exception. 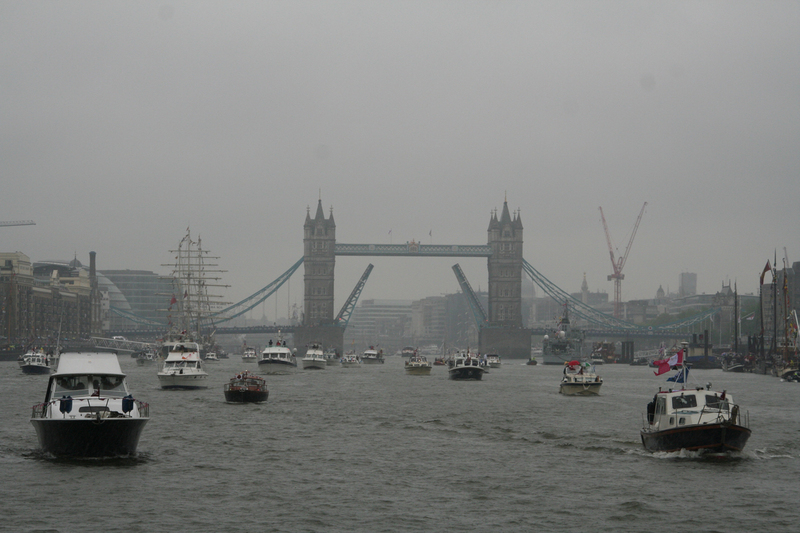 The Avenue of Sail and Tower Bridge soon came into sight, a tremendous display of decorated barges and tall ships could be seen lining the route, from the Pool of London by HMS Belfast past Tower Bridge to Wapping. Building up to the crescendo motorboats passed under Tower Bridge with everyone eagerly waiting to see the Queen on board the Spirit of Chartwell, moored outside HMS President. 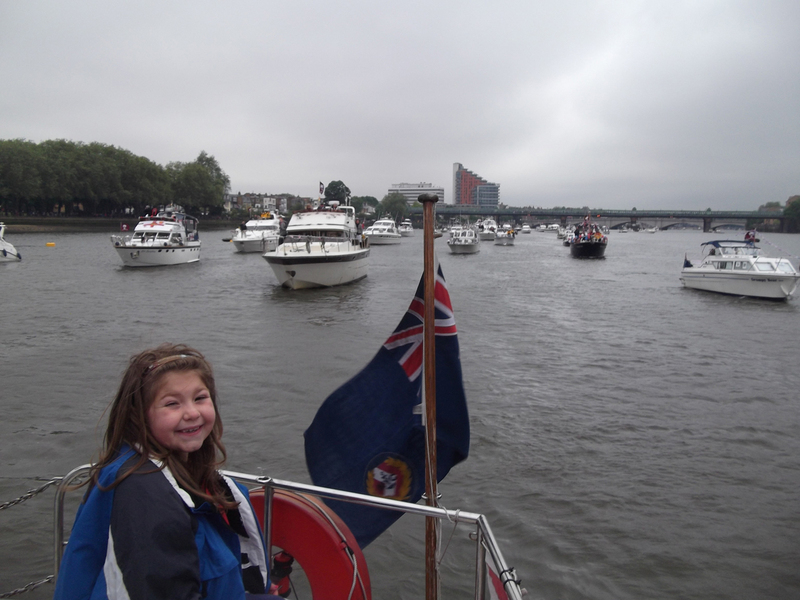 TMYC boats were ready to salute the Queen, just as it’s done for the annual Sailpast when the Commodore takes the salute on behalf of the club. 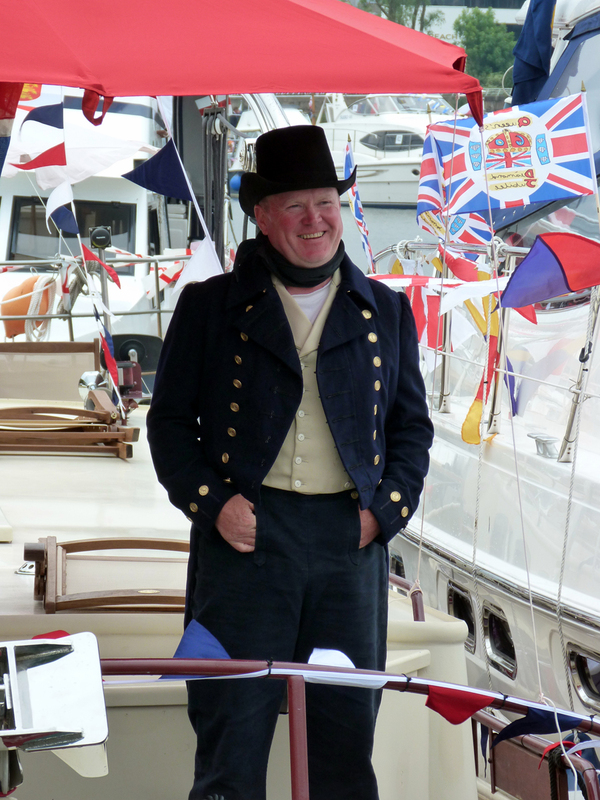 With most dressed in full yachting rig or period costume, everyone stood proudly as each row of boats took the salute. 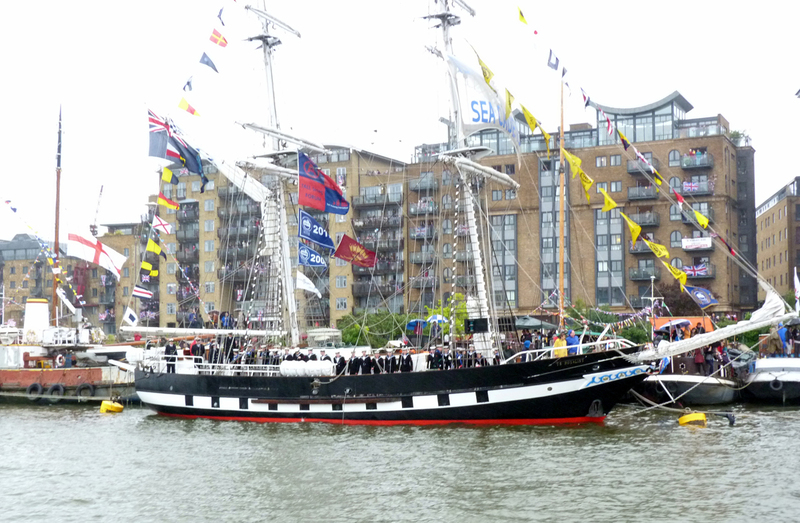 Dipping the TMYC Blue Ensigns followed by loud cheers and waves, it was a heartfelt honour to salute the Queen. 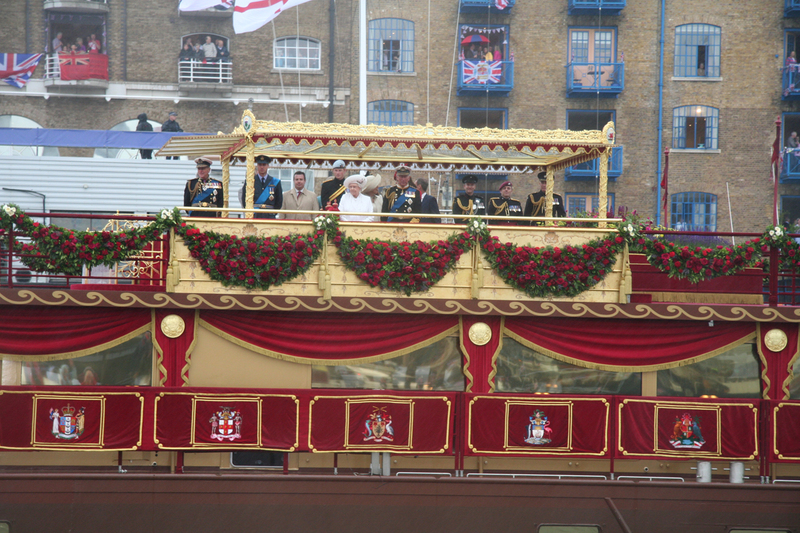 The rain was no issue, everyone was captivated by the Royal Family watching over the boats and waving back. 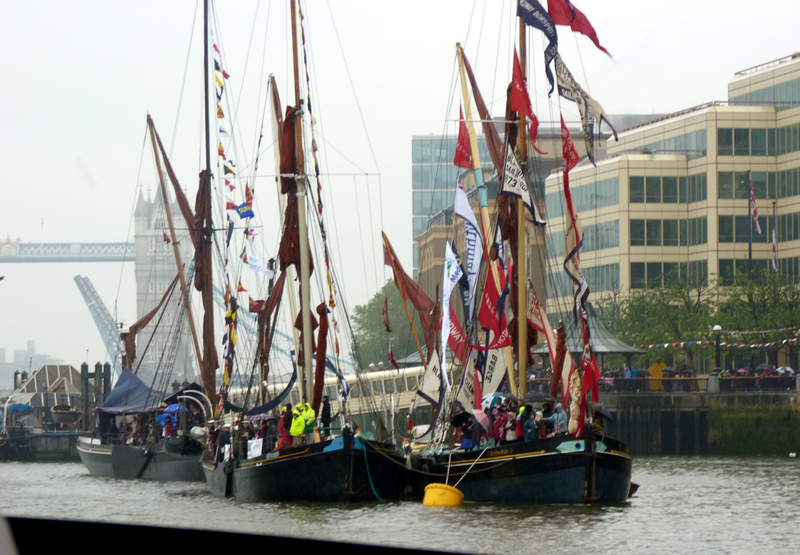 The procession continued on through the Avenue of Sail, cheers and waves continued too as all boats headed for the Docklands to moor up, and peel off the soaking wet weather gear. With so many boats queuing to enter, the PLA adopted an aircraft circling system to keep everyone moving rather than colliding and jostling for position outside the lock. It worked, with the exception of many of the open boats having people developing symptoms of hypothermia. It had been a long day for them, with no cover or basic facilities they were rightfully sent to the front of the queue. Others less fortunate were rescued by the RNLI and rushed to waiting ambulances. 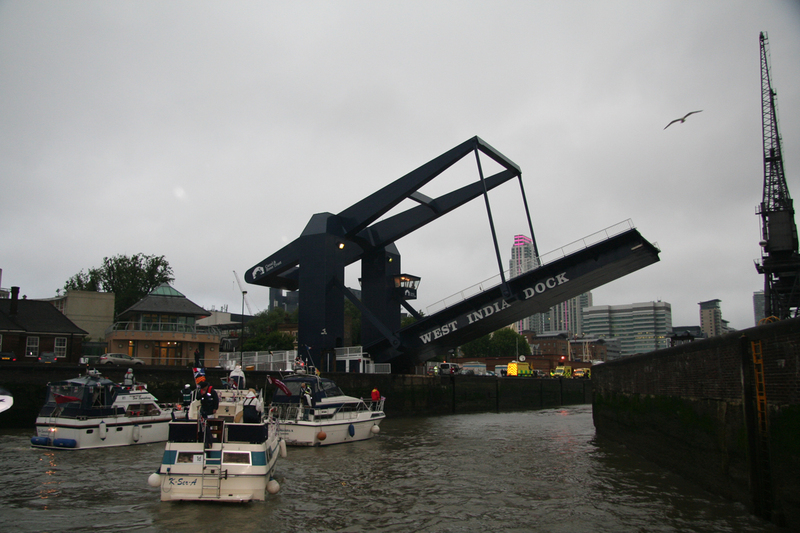 By 8.30pm all TMYC boats were in the West India lock then straight through to moor in Millwall Dock. By 9pm all lines were secured and engines switched off to the sounds of sighs of relief that everything had gone without a hitch. The day was completed with celebratory meals and plenty of champagne, some even took advantage of the free drinks vouchers circulated to boats on arrival for a local bar but that’s a story for another day! 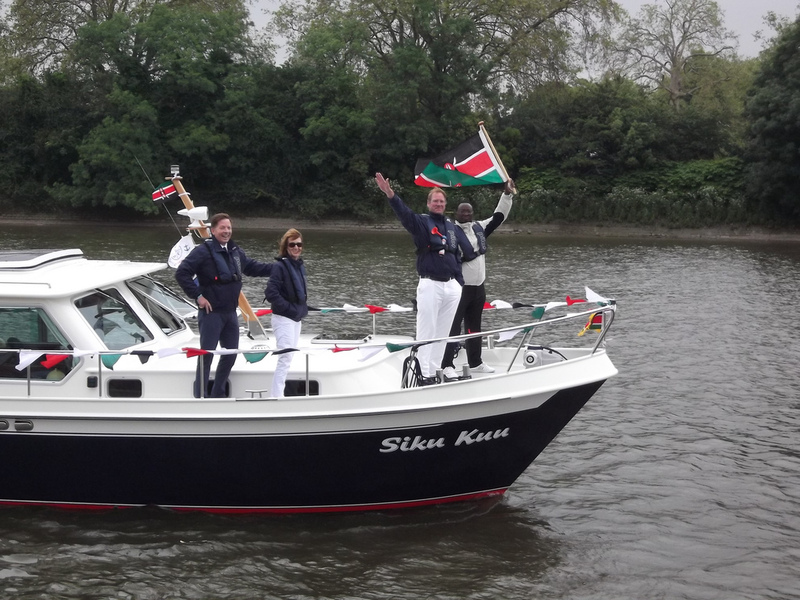 Meanwhile the TMYC Jubilee Party ran by Yo Duke was in full swing. 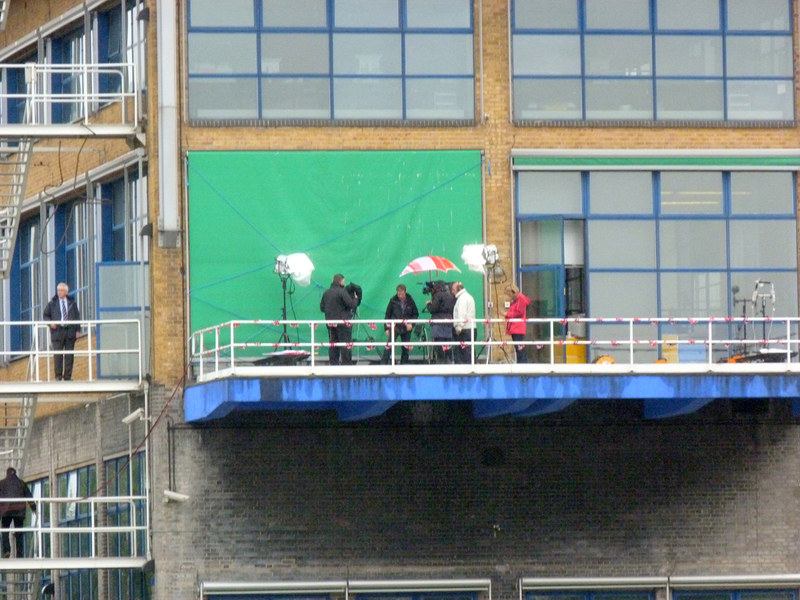 Large umbrellas sheltered those seated outside watching the television that was tucked inside the doorway from the rain, others watched from inside. 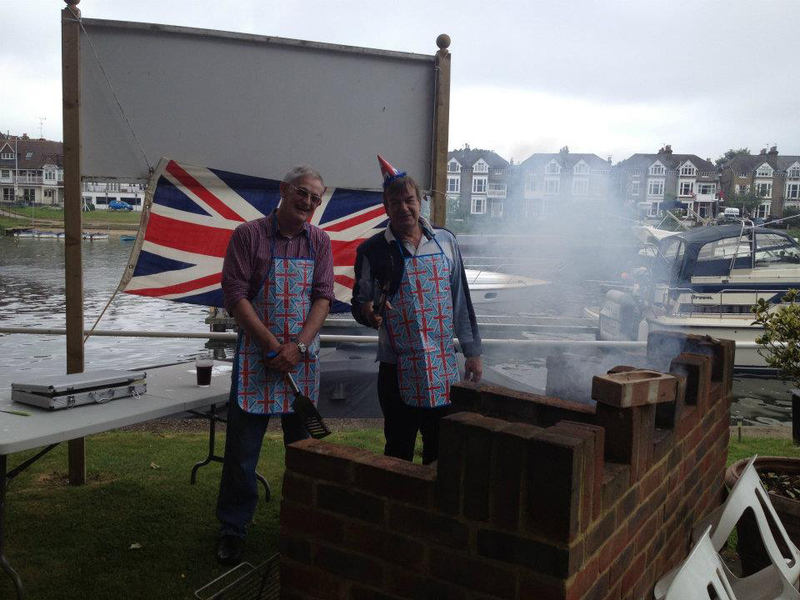 Everything continued as planned with a barbecue and an abundance of delicious food in bunting clad surroundings. 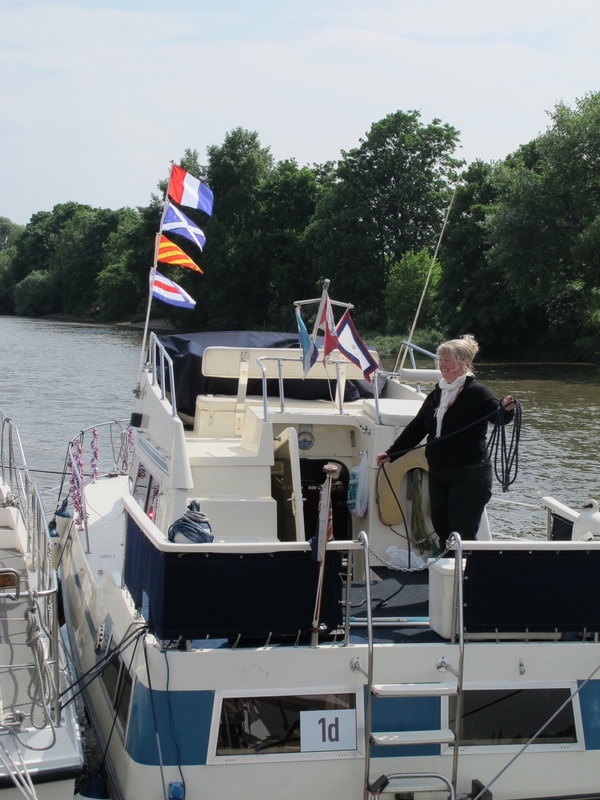 Members had such a good time that the party continued into the following day joined by some boats who had returned on the Monday. 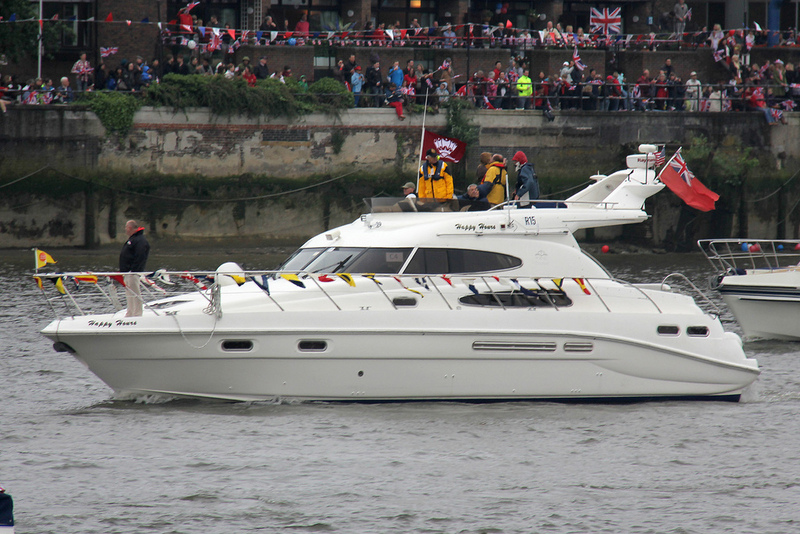 TMYC boats staying the extra day in the Docklands had drinks arranged by the Commodore and his Lady, before watching the Diamond Jubilee Concert. A perfect party atmosphere to end such a prestigious event, but not quite the end. 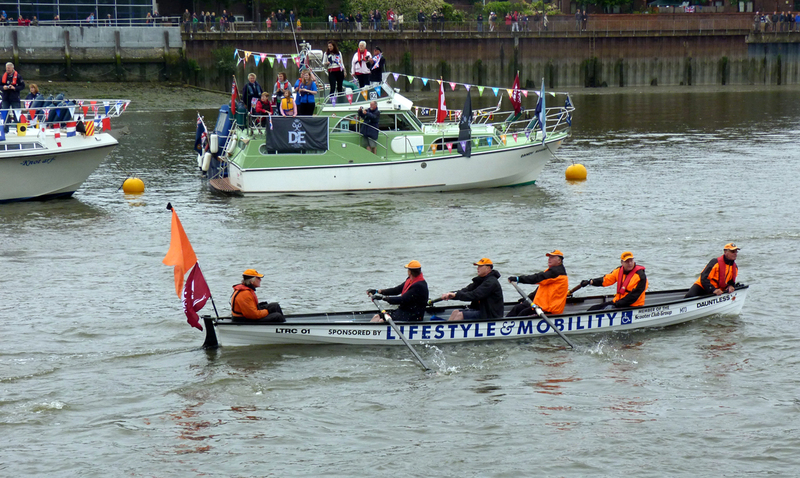 The return journey on Tuesday found the pageant spirit was still not over, cheering and waving to the boats continued on until reaching the club where members were ready to help take the lines and welcome everyone home. 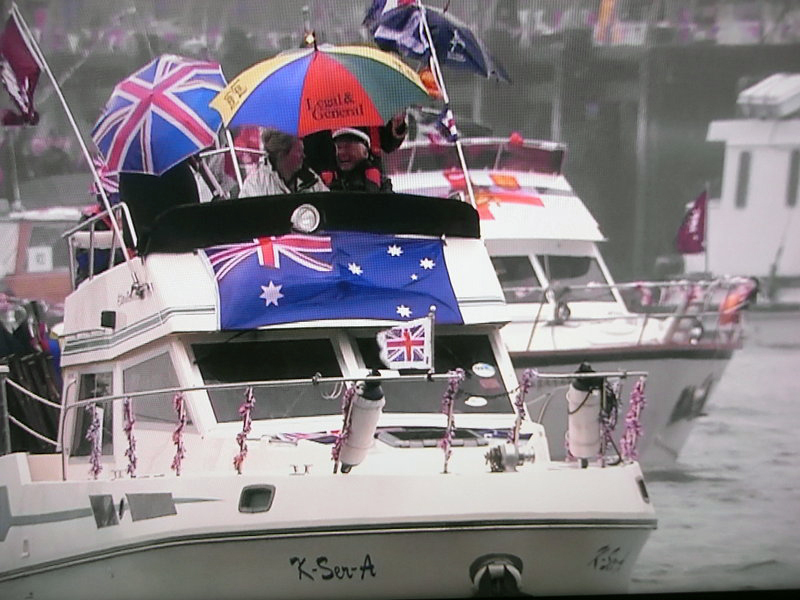 NB: Originally said to be a Flotilla of 1000 – perhaps only the boats covered by the BBC were counted?